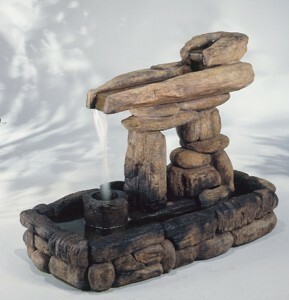 The Bubbling Rock Fountain by Henri Studio features an underground basin made of sturdy plastic which the bubbling rock fountain fits down into. The pebbles surrounding the base can be purchased separately, or you can use your own ground cover. Water cascades from a plume at the top of the rock feature and disappears into the ground below into a 20 gallon or 50 gallon basin. – The Bubbling Rock Fountain is shown in the Unique Relic Stain (RU) finish. 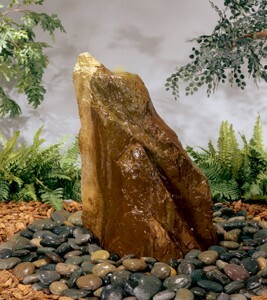 – Fountain Size: The Bubbling Rock Fountain is 25 inches tall and the underground basin is 27.5 inches in diameter. It weighs 118 pounds. 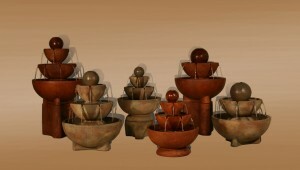 – Each Henri Studio Fountain is made to order. 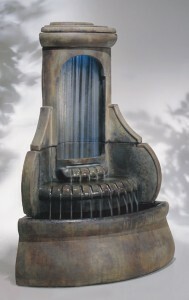 Typically, within 3-4 weeks of placing your order your fountain will be shipped via common carrier. The driver will contact you prior to delivery to arrange a time frame to be available to take delivery. The parts will be securely packaged on pallets. The truck driver will be responsible for placing your order curbside, and all lift-gate fees will be included with no charges due at delivery. It will be up to you to get your fountain to your desired location on your property.